Heat oven to 425°F. Grease cookie sheet. Unroll dough; place on greased cookie sheet. Starting at center, press out dough with fingers to form 15x10-inch rectangle. Bake at 425°F. for 7 minutes or until crust just begins to brown. Meanwhile, cook chicken breast fillets as directed on package. Finely chop chicken. In small bowl, combine tomato sauce and barbecue sauce; mix well. Spread tomato sauce mixture over partially baked pizza crust. 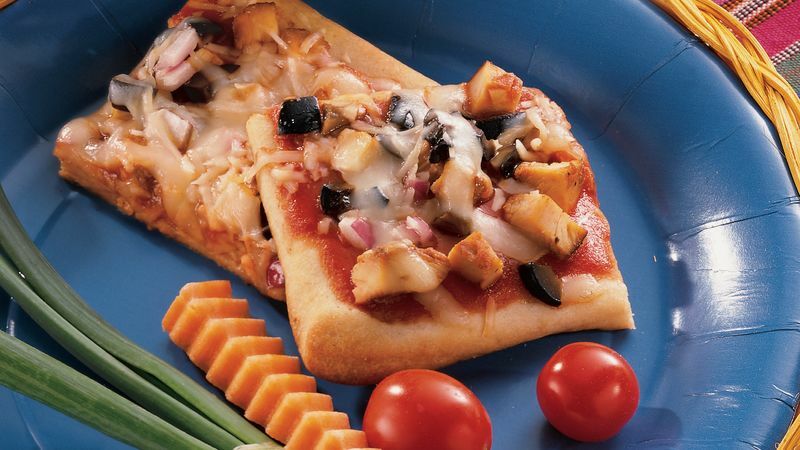 Top with chicken, olives, onion and cheeses. Bake at 425°F. for 6 to 10 minutes or until crust is deep golden brown and cheese is melted.